While I write about many new attacks against our computers, I was amused to find out that possibly the first wireless hack was in 1903. A wireless competitor of Guglielmo Marconi, named Nevil Maskelyne, hacked a demonstration between Marconi and Sir John Ambrose Fleming at the prestigious Royal Institution in London. Maskelyne was upset that Marconi was lying about the security of his wireless transmissions. Marconi claimed his transmissions were secure because he used "syntonic tuning" of the signal. This claim was important since the government was using wireless transmissions for secret messages. Just the year before Marconi had demonstrated a transatlantic message, so his status and credibility was very high. Needless to say, this created quite a furor and the two inventors exchanged dueling letters in the Times. Maskelyne is best known as a magician and author. 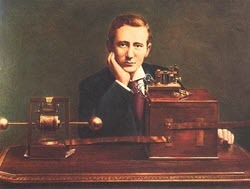 Marconi, however, started a Transatlantic radio service and won a Nobel Prize with Karl Ferdinand Braun for his contributions to wireless telegraphy. This did convince security conscious governments however, to begin using encryption with their wireless communications. Privacy of the transmission: I don't know whether Maskelyne could read Marconi's message, or only disrupt it. Authentication: Is the person on the other end who you think it is? In this case no, it was Maskelyne, not Marconi who sent the message to Fleming. Message Integrity: The message must be exactly what was sent, without any substitution. Here again, the security failed as the message received was not the message sent.